Next time you go to your pharmacy, peek around the counter. You might see a large machine tucked behind a shelf. It’s a pharmacy robot and it's supposed to make medicine safer. But the News 4 I-Team is going to show you how these machines can multiply one mistake into dozens. 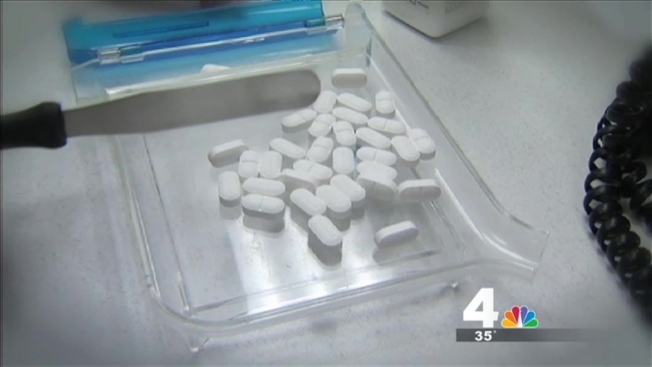 "They provide a valuable service,” said Carmine Catizone, the Executive Director of the National Association of Boards of Pharmacy. He told us more and more large chains are using pharmacy robots. In a sales video from a prominent robot maker you can see how a technician types a prescription into a computer. A robotic arm pulls pills from a “cell," or plastic bin filled with medication, and places the pills in a bottle before labeling it. Catizone explained this high-technology "can help with dispensing. And, from what we've heard of the error rate, it's significantly lower than if you have technicians or even a pharmacist sometimes filling prescriptions." Dr. Sidney Wolfe at the medical watchdog Public Citizen said there have been at least two well-respected medical studies that found robots do cut down on medication errors. But that's only if humans load them properly. Wolfe said, "A human being has to fill the machine with various kinds of medicine and they could make a mistake. And if they make a mistake, the machine dispenses what it's told to do." "The mistakes that were being made were really human error," said Joe Zorek, a pharmacist who worked in a large national chain that used a robot. When it was installed, Zorek said his company also upped the number of prescriptions his store was expected to fill to as many as 900 a day, forcing his staff to rush. "Say a cell ran out, you cheated.” Zorek said. “Run over, grab a bottle from the stock area, put the bottle in there." But then he said it happened. An employee put 250 milligrams of an antibiotic into a cell already partially loaded with 500 milligram pills. "Somebody had inadvertently grabbed the wrong bottle," Zorek said. “So, as a result, we were dispensing 500 mgs with the 250mgs. It's not a big deal you might think, but if the patient is sick and didn't get well and they needed to see the doctor again or needed another prescription, it becomes a problem." Some mistakes involve dosage, others involve mixing up different drugs. In New Jersey, the attorney general found a robot gave as many as 50 children a breast cancer drug instead of fluoride tablets. After the publicity surrounding that event, Zorek said his company instituted a new system aimed at preventing robot mistakes. But admitted you may never know you got the wrong medicine because the pharmacy may never catch the mistake if a robot was involved. "There had to be at least 47 to 60 prescriptions that were filled with this antibiotic.” Zorek explained. “Were they all mis-filled? We don't know." All of the experts we talked with say you shouldn’t be afraid of pharmacies using robots to fill your prescription. But, you should also always double check your prescription by looking up what the drug looks like and comparing it to what's in your bottle. If you think there might be a problem, call your doctor.